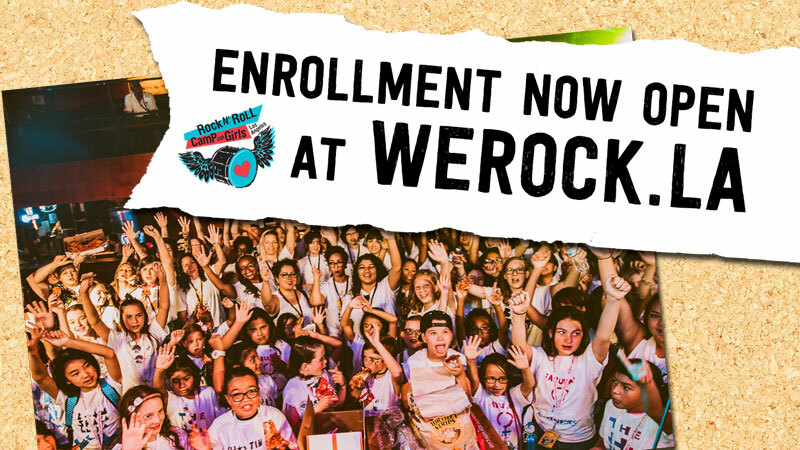 Rock n' Roll Camp for Girls Los Angeles – Empowering girls through music. Rock n’ Roll Camp for Girls Los Angeles is a social justice non-profit dedicated to empowering girls through music. Camper enrollment for all 2019 programs now open! Enrollment opens Monday, March 5th! Read the recap about our First Ever Gala! I love being in such a positive environment. She feels strong, engaged, challenged, and accepted here. I learned I can be loud. [RCGLA] is the one thing she looks forward to more than anything else all year long. It made me feel more confident and I made new friends. Over the years, RCGLA has remained a shining light and source of strength, positivity, acceptance, and love. Enrollment is now open for Summer Camp, Music Video Program, and Volunteer-in-Training Program. Music Video Program will be during Session 1. Enrollment for Summer Camp, Music Video Program, and Volunteer-in-Training Program opens in early spring! Volunteer applications will also be available this spring. Sign up for our mailing list and/or follow us on social media to get the latest info about enrollment and volunteer applications. Rock n’ Roll Camp for Girls Los Angeles First Ever Gala! On Thursday May 3rd, entertainment and music communities came together for a special evening under the stars at the storied Houdini Estate in Laurel Canyon in support our First Ever Gala! and our mission of empowering girls through music.